Tiger Lanyards: Luxurious Tiger Print Lanyards, Tiger Stripes or Patterns Printed Lanyards. Tiger lanyards are pre-printed lanyards with tiger stripes. The tiger stripes or tiger patterns are printed with dye-sublimated colors on both sides of the lanyards. The world's largest cat - tiger, is a powerful and solitary predator. Today, tiger is a critically endangered animal, possibly fewer than 5000 remain. And there never have been any wild tigers in Africa. Lions, tigers, and cheetah are the big cats in Africa. Tigers are strictly Asian cats - known as Bali, Indo-Chinese, Siberian, Java, Bengal, Caspian, South China and Sumatran tigers. Tigers are solitary and independent creatures., they do not form large groups like lions do. Nowadays, tigers live in small fragmented populations, mostly in wildlife reserves, protected forests and national parks. Our standard tiger print lanyards come with heavy duty nickel color swivel hooks, badge clips, key rings, or cell phone connectors. Tiger print lanyards also come with a variety of optional hardware attachments, such as safety break-away buckles, heavy duty nickel color, gold, antique brass or black nickel color snap hooks. The big wild cat - tiger print lanyards are good for zoo's gift shop resale stores, kids party, outdoor adventures, school or events fundraising, promotional giveaway for events or conventions, as gifts, or as fashion name badges to wear. The tiger print lanyards with the cell phone attachment can be used to carry camera, cellular phone, USB flash memory cards, flash drives, CD, iPod or MP3 players, flash lights, small meters, and electronic devices etc. Please check our online catalogs for more luxurious lanyards with animal prints. The famous big cat - Siberian tiger or "Panthera tigris altaica" has very sharp teeth, retractable huge claws, black stripes on long orange gold color fur. Those stripes help to camouflage tigers in the tall grasses. Tiger has very keen vision, hearing and sense of smelling. Tigers run extremely fast over short distances and can leap 10 feet in a single bound. 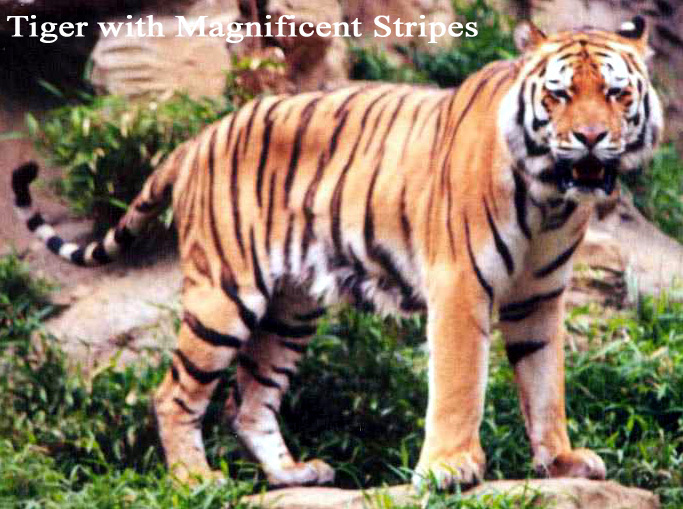 The bright and magnificent tiger stripes or tiger fur patterns are widely used on fashion industries, such as jewelry, purses, handbags, clothing, rugs, tablecloths, napkins, towels, sheets, collars, cuffs, lanyards, pet leashes, paper bags, wall papers, packaging materials, paintings, and decorative items, etc. 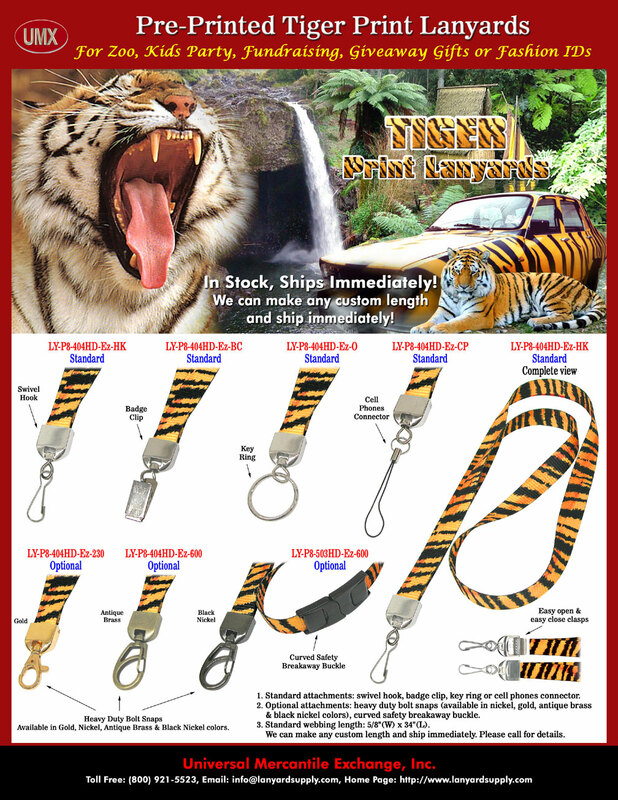 Specifications: Luxurious Tiger Lanyards: Tiger Print Lanyards, Tiger Stripes or Patterns Printed Lanyards - Tiger Lanyard Stores or Gif Shop Supplies. 1. Standard Width of Tiger Print Lanyards: 5/8". 4. Standard Colors of Webbing/Straps: Tiger Prints. Optional: Any Pantone PMS colors with a minimum order of 5000 pieces or more. 7. Way of Pre-Printed Patterns: Dye sublimated on both sides with tiger prints. 8. Custom Imprinting: Use the tiger print patterns as back ground. Any customized or personalized logo printed on tiger lanyards available. Can be use as tiger print neck lanyards or tiger print wrist lanyards for ID name badges, dog leashes, tools holders and as shoulder straps for handbags, bags, or purses. You are viewing > Lanyards > Ez-Adjustable Neck Wear Models > Luxurious Tiger Lanyard: Tiger Print Lanyard, Tiger Stripe or Pattern Printed Lanyard - Tiger Lanyard Store or Gif Shop Supply.